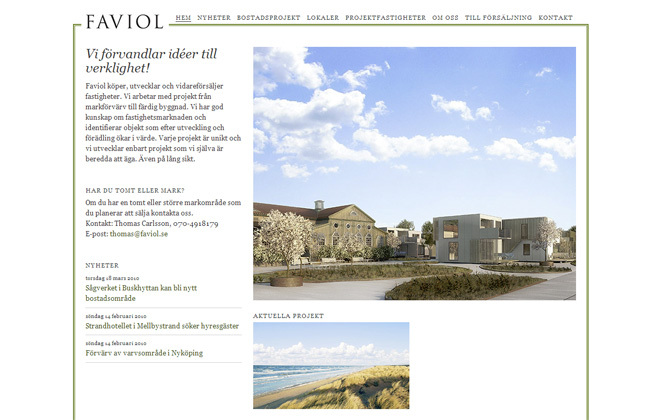 The real estate development company Faviol needed help creating a website for presentation of their projects. The website is developed using a standard WordPress implementation, with the addition of a set of templates handling the front page and pages containing subpages. The redirect from the parent pages to their subpages was made using a custom-made template. The slideshow was made using the SuperSlider-Show plugin for WordPress. The CSS in the plugin had to be modified to give it a custom appearance as well as to make it work properly in IE6.